OIL LEAKAGE AND OIL LEVEL 9, disassembly and Assembly (R200 2-pinion) 16, aDJUSTMENT AND SELECTION OF ADJUSTING WASHERS 25, disassembly and Assembly (R200V LSD) 36. ADJUSTMENT AND SELECTION OF ADJUSTING WASHERS 45, sERVICE DATA AND SPECIFICATIONS (SDS) 56, check for the correct installation status prior to removal or disassembly, be certain they do not interfere with the function of parts when applied. Overhaul should be done in a clean work area, it is preferable to work dustproof area, before disassembly, using steam or white gasoline, completely remove sand and mud exterior, the unit, preventing them from entering into the unit during disassembly assembly, check appearance of the disassembled parts for damage, deformation, and unusual wear. With a new ones necessary, gaskets, seals and O-rings should be replaced any time when unit disassembled, in principle, tighten bolts or nuts gradually in several steps working diagonally from inside outside, tightening sequence specified, observe it. Clean and flush the parts sufficiently blow-dry them, be careful not to damage sliding surfaces mating surfaces, when applying sealant, remove the old sealant from the mounting surface; then remove any moisture, oil, and foreign materials from the application mounting surfaces. Always use shop paper for cleaning inside components, avoid using cotton gloves or shop rags to prevent entering lint, during assembly, observe the specified tightening torque, and apply new gear oil, petroleum jelly, or multipurpose grease as specified for each vehicle, necessary, the actual shapes of Kent-Moore tools may differ from those of special service tools illustrated here. Removing and installing drive pinion lock nut, installing pinion rear bearing outer race, measuring pinion bearing preload total, removing and installing side bearing inner. Removing pinion rear bearing inner race, installing pinion front bearing outer race, installing pinion front bearing outer race (Use, installing pinion rear bearing inner race. 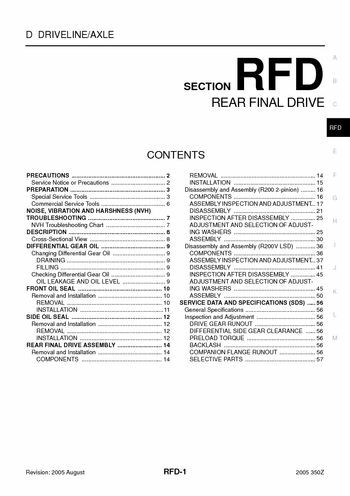 Adjusting bearing preload pinion gear, installing pinion front bearing inner race, refer to (R200 2-pinion), RFD-39 (R200V LSD), refer to (R200 2-pinion), RFD-40 (R200V LSD). NOISE, VIBRATION AND HARSHNESS (NVH) TROUBLESHOOTING, nVH in FAX, RAX, FSU RSU sections, refer to (R200 2-pinion), RFD-45 (R200V LSD), refer to (R200 2-pinion), RFD-38 (R200V LSD). Use the chart below to help you find the cause of the symptom, remove drain plug drain gear oil, set a gasket on drain plug and install it final drive assembly, and tighten to the specified torque. The specified level near filler plug mounting hole, after refilling oil, check oil level, install it to final drive assembly, make sure that oil is not leaking from final drive assembly around it. Check oil level from filler plug mounting hole as shown figure, do not start engine while checking oil level, set a gasket on filler plug and install it final drive assembly, refer to "COMPONENTS" (R200 2-pinion), RFD-36. Put matching mark on the end of the drive pinion, mark should be in line with the matching mark A companion, the matching mark A on the final drive companion flange indicates the maximum vertical runout position.